Some mascot stories start with an unusual beginning and Bill the Goat’s beginning is no stranger to that. For centuries, goats were used on naval ships to provide milk and butter while eating the unwanted food and garbage. The United States Navy carried this tradition on and used these livestock on their ships. The word ‘billy goat’ replace he- or male-goat on the ships since the 19th century. The rule was one goat per ship. One legend has it that a goat died at sea and while a couple of ensigns were on the way back from sending the goat through the taxidermist, they decided to wear the skin. Navy won the game. 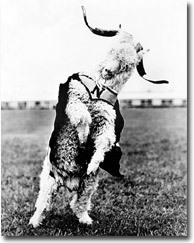 It wasn’t until 1893, however, that a live goat set foot on a Navy football field. El Cid made his debut during the Army-Navy game. Navy went on to defeat the bitter rival a whopping 6-3. 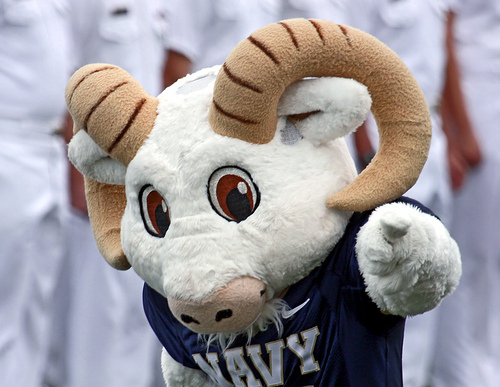 Two major victories and the Midshipmen had their mascot. This, of course, wasn’t without some trial. Reported trial mascots include a gorilla, two cats, a bulldog, and a carrier pigeon. In honor of ship bearing goats, Commander Colby M. Chester gave the nickname of ‘Bill’ to the feisty live mascot in the early 1900s. 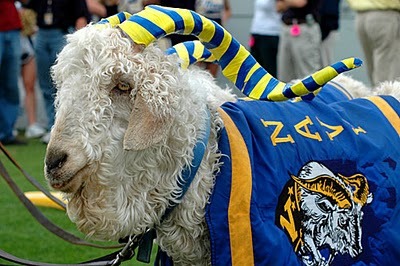 For many years, the live Bill the Goat trotted the field and carried the spirit of the Midshipmen through heated pigskin battles. That was until the Navy needed some backup to protect against kidnappings. This is where the plush Bill the Goat comes in. 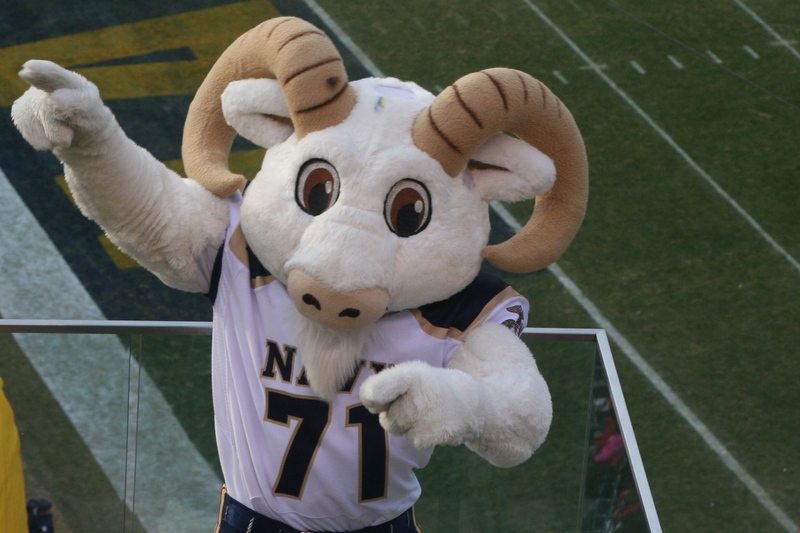 Sponsored by the academy’s class of 1971, the plush Bill the Goat makes the trips to road games and takes control of the more wacky side of mascotting for the Navy Midshipmen. The live mascot still makes appearances, through the help of his 15 or so handlers, but Bill is the marketing face for this operation. And he is quite the operation indeed. As you see in his United Cheerleaders Association 2010 audition video, not only does he pump up the crowd, but he also pumps some lead bullets into targets. The plush Bill the Goat sports a football uniform covering the white furred body traditional seen with a goat. As an added benefit, the plush Bill has a huge head, a huge set of horns, and a huge sported goatee. That makes sense. We also enjoy the interlaced clips of missile firing off while Bill is hamming up to the crowd. Bill the Goat makes the cut. With the live version’s storied tradition represented and the plush version’s on the field shenanigans, the Navy Midshipmen have their bases covered in terms of mascotdom. It’s no wonder the plush version received a finalist nomination to Capital One’s Mascot of the Year last year. In honor of the fallen soldiers today, we tip our hat in remembrance. Have a great Memorial Day and try not to eat any garbage like Bill the Goat here.